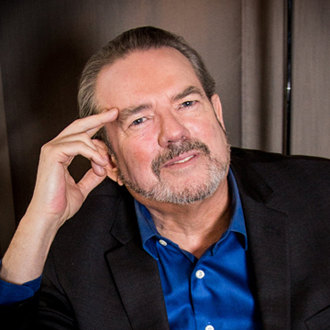 Since breaking through as a young hit songwriter in the mid-1960s, Jimmy Webb has had a tremendous career as a singer/songwriter who has written many classic songs. He has won multiple Grammy Awards, and he’s been inducted into the Songwriters Hall of Fame. Notably, in 2016 he was named by Rolling Stone magazine as one of the top 50 Greatest Songwriters of All Time. Still going strong after 50 years in the music business, Webb has just released his memoir, The Cake and the Rain (published by St. Martin’s Press). This book brings to life a 15-year span of his unique career (roughly 1955-1970), written with the same sense of poetry and story as his song lyrics. This is Webb’s second book; his first book Tunesmith: Inside the Art of Songwriting, was published in 1998. As a songwriter, Webb has written many pop standards which are now part of the Great American Songbook. The following songs were all Top 10 hits on the Billboard Hot 100 chart: “MacArthur Park” (recorded by Richard Harris and later a #1 cover hit for Donna Summer); “By The Time I Get to Phoenix,” “Wichita Lineman,” “Galveston,” “Honey Come Back” and “Where’s the Playground Suzie” (recorded by Glen Campbell); “Up, Up And Away” (the 5th Dimension, which won the Grammy Award for Song of the Year and Record of the Year); “Worst That Could Happen” (Brooklyn Bridge); and “All I Know” (Art Garfunkel). In addition, Webb has written other songs that have become classics. His song “The Highwayman” was recorded by the country supergroup, The Highwaymen (consisting of Johnny Cash, Willie Nelson, Waylon Jennings & Kris Kristofferson). Their version became a #1 country hit, and won the Grammy Award for Best Country Song in 1986. Another Webb standard is “The Moon’s A Harsh Mistress,” which was recorded by Linda Ronstadt, Joe Cocker, Josh Groban and other artists. Webb has been such a respected songwriter, that some popular artists have recorded albums that consisted of all Webb compositions, or a substantial number. In 1974, Glen Campbell recorded the album, Reunion: The Songs of Jimmy Webb. Then in 1977, Art Garfunkel’s album, Watermark, included 10 songs written by Webb. Also, Linda Ronstadt’s triple platinum, 1989 album Cry Like a Rainstorm, Howl Like the Wind, featured four Webb songs. Notably, it was recently announced that Glen Campbell, who has been diagnosed with Alzheimer’s disease, will be releasing his final album in June. The album is called Adios (named after a Jimmy Webb song) and includes four songs by Webb. Besides the artists listed above, here’s a list of other artists who have recorded songs by Webb: Frank Sinatra, Barbra Streisand, Diana Ross & The Supremes, R.E.M., Roberta Flack, Carly Simon, Tom Jones, the Temptations, the Four Tops, Johnny Rivers, B.J. Thomas, Harry Nilsson, Dionne Warwick, Cher, Judy Collins, Gregg Allman, the Everly Brothers, Amy Grant, John Denver, Kenny Rogers, Weird Al Yankovic, Sheena Easton, David Crosby, Michael Feinstein, Nina Simone, Dusty Springfield and Aimee Mann. 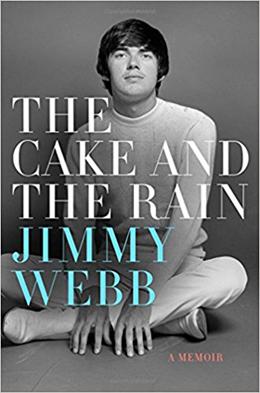 Here’s the cover of Jimmy Webb’s new book, The Cake and the Rain. Webb also remains active as a live performer who tours the U.S. and internationally. This week (on May 3) he is performing at a special concert to be held in his honor, at Carnegie Hall in New York City. He will be joined onstage by Art Garfunkel, Toby Keith, Dwight Yoakam, the 5th Dimension, Judy Collins, Graham Nash, Michael Douglas, Hanson and other artists. DK: Congratulations on the release of your new memoir. I read that the book mainly covers your years from 1955-1970. Is that correct? Jimmy Webb: Yes that’s true, except it really starts before the war (World War II), with my father and my mother meeting. So it’s actually a little wider window (of years), but that’s close enough. DK: Will you be writing a second volume of your memoir, that will cover your later years? Webb: Well I would hope so, but you know, it all depends on the public, and the reception the book receives. So far, we feel really good about [the book}—we’ve had a lot of positive feedback, and we’ve had very successful events (to promote the book). We’re sold out for our signing event (and show) in Los Angeles (at the Grammy Museum). So the signs are good, and I can answer you this way…I’m primed to write another book. Once I got into the stride of it, I really enjoyed doing it. [It was nice to] break out of the 3-minute limit, you know…the (approximately) 47 words…that you can throw down into a song. And it was edifying, an epiphany in a way to be able to completely write pages and pages of what to me are just lyrics (laughs). You know, I’ve been saving stories all my life, thinking someday I might write a book, and I was never really sure I would. But I got a good answer from (book publisher) St. Martin’s Press—they were very excited about telling these stories. And so I went ahead and did it, and I’m glad I did. DK: When people read your book, what are some of the key things they’ll learn about you? Webb: Well, I think they would learn that I’m a dichotomy in many ways. That I lived in a traditional world of songwriting and wrote music and communed closely with people like Mr. (Frank) Sinatra, Tony Bennett, Liza Minnelli and Glen Campbell among others…sort of the middle of the road world. But on the other hand, I was working with rock & roll artists like Artie Garfunkel and Linda Ronstadt, and I went to the Monterey Pop Festival. I very much wanted to be a member of my generation…I wanted to stand for something. I wanted to do something about the world. And part of my struggle was really to identify myself as a member of my own generation. DK: Back in the 1960s and ‘70s, when you were one of the hottest songwriters in the music business, how did it feel to be in a great creative mode and have your songs reach so many people? Webb: Well, what’s not to like…it was great. I went from paying no taxes to [paying a lot of taxes]. I was living the dream. You know, the California dream that everyone talks about, really became a reality for me. It was…dizzying, and it was confusing in a way. [There was] all of the good energy that was coming at me, and with that came some bad energy as well. You know, I made some mistakes. In the book, I don’t duck anything. I made up my mind when I decided to write it, that I would tell the truth about myself. I would tell the God-honest truth to the best of my ability, because I didn’t see any point in writing a memoir if one isn’t gonna do that. So you know, it was very exhilarating (writing the book)—I would go there and I would come down and then I would go there again. And I learned that it was a roller coaster, and that was the life I’d chosen. As I got older, I began to take it in stride, take the good with the bad. Take those moments that don’t seem quite real, and appreciate the fact that they really aren’t quite real. DK: You’ve had a longtime friendship and collaboration with Glen Campbell, and your song “Adios” is the title track of his upcoming, final album. Can you tell me about your collaboration with Glen, and his new album? Webb: Well, I know that the album was produced by Carl Jackson, who is an old, dear friend of mine. He’s a virtuoso banjo player, and he was on the road with Glen for many years. I personally didn’t have anything to do with the record, and I don’t really have any information on that. I did hear the four tracks that are my songs, and I think it sounds absolutely fantastic. It sounds like Glen in his prime to me. I’m very honored that what essentially will be his last album will have four of my songs on it. DK: Your new book is called The Cake and the Rain, which paraphrases your lyric from your hit, “MacArthur Park.” Of all your songs, would you say “MacArthur Park” has had the greatest impact? Webb: I wouldn’t say that. But I would say that it’s been covered more than any other song I wrote. It’s also caused some controversy, [because] it has its detractors. It has people who absolutely love it and it has people who absolutely hate it. People who don’t understand it and don’t want to understand it. I mean, it’s been a very notorious song—that’s a good word. It’s also had a career in parody, with Weird Al Yankovic (covering it as “Jurassic Park”). It’s been recorded by jazz artists like Stan Kenton and Maynard Ferguson, and Motown artists like the Four Tops. Mr. Sinatra recorded the middle section of “MacArthur Park.” So it gotten a lot of attention—the Beatles noticed it. They noticed it was 7:21 long and they went into the studio and lengthened “Hey Jude” so it measured out at 7:17. So yeah, I think it had some impact on the world of Top 40 radio, because it was probably one of the first times they were playing a song longer than three minutes. DK: Of all the songs you’ve written, are there a couple songs that have the most meaning to you, that you’re most proud of? DK: Last month, I saw Art Garfunkel perform in concert, and he said that you were one of his all-time favorite songwriters. And I know that he will be performing at your special concert at Carnegie Hall. Can you talk about your collaboration with Art? Webb: Well, Art was a wonderful encounter in my life, because he opened the door for me to get involved with some rock artists on a pure level. He introduced me to people like James Taylor. I think [he just] shored up my street cred as something more than a middle of the road songwriter. We did a whole album together called Watermark in Muscle Shoals, Alabama, and that was quite an experience. But our relationship goes beyond that, into family—his son James if my godson, and one of my sons is his godson. We’ve played at Carnegie Hall together before, and he sang on my last album, Still Within the Sound of My Voice. It just turned into a very close and loving relationship. We both love books, we both sort of collect experiences, and we love to share them. And we love to communicate on an intellectual level. So it’s interesting that you would ask me about Art, because it started off as a musical [collaboration] and it’s become much more than that. You know, it just wouldn’t be right to have a concert, and not have Art there.